This adorable spinner ring is also know as a worry ring. 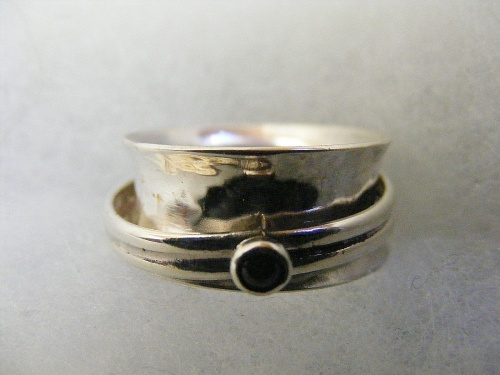 The spinner floats over a hammered sterling silver band and the spinner itself made of two pieces of wire soldered together has a tiny garnet stone to make it pop. This ring is made to order! When custom ordering, please indicate your ring size be sure to take into consideration that this is a wide band so you may need a half size larger than normal. I highly recommend that you have your finger sized on a WIDE shank ring sizer by a professional jewelry store. Custom ordered rings are not returnable.